This should have served as an inspiration for Rio Bravo, as it's written on the cover of the italian dvd release. Trail Street (1947) - 5/10. Randolph Scott and Robert Ryan together again for the first time! Too bad it's on account of the evil cattlemen afflicting the virtuous farmers. When was Hollywood ever going to get around to making a film about saintly cattlemen and satanic farmers? This flick also has a couple of love interests, the goody-goody girl and the saloon tart who turns out to be the more principled of the two. Yeah, that formula got worked a bit. And did I mention the main situation has to do with a couple of locked-up hooligans and the gang that's determined to break them out? Featuring the obnoxious "Gabby" Hayes in the Walter Brennan/Arthur Hunnicutt role. 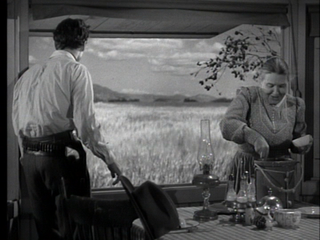 There's also a sub-plot about Robert Ryan discovering that Winter wheat is the miracle crop that's going to save Kansas and make it the bread-basket of the nation. The only truly inventive bit of visual narration has him coming upon the discovery suddenly and unexpectedly. Otherwise, the film is pedestrian in the extreme. "A frame within the frame! Wait until my friend Sergio sees this!" The two musical numbers (I tell you: I prefer these to those of Rio Bravo) feature two songs in a style not in line with the times. But even more ridiculous is the fact that in the second one the male choir of 4 is dressed up in Dixieland style, with straw hats and striped jackets. I was put off by the obvious musical style of the saloon numbers in this too. There is a man very much like Billy House who is in this film. He has a mocking smile. He shoots a man and then imitates the surprised look of the dying man he has just shot. And then gives a wicked mocking smile.